"They'll call me freedom, just like Wavin' a flag": so opens this year's official World Cup anthem by Somali-Canadian poet, rapper and musician K'Naan. K'Naan is your Connector of the Day. It's an uplifting hip-hop number, taken from his recent album Troubadour. In an art form that relies on story-telling, K'Naan's own background offers a tale of overcoming adversity. He escaped life in violent somalia, and achieved fame in his adopted country of Canada and around the world with his African-influenced rap tunes. He's proven an articulate spokesman for Somalia and the continent as a whole, yet the use of one of his songs for the South Africa World Cup theme has generated some controversy for the simple fact it wasn't written or recorded in Africa itself. 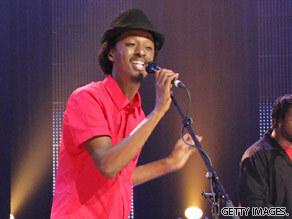 Critics have compared K'Naan's sound to both Bob Marley and Eminem, but he describes his work as "urgent music with a message". He has taken part in some high-profile musical collaborations: working with British band Keane in 2009 and more recently with American artist Jason Mraz. So here's your chance to ask K'Naan a question about his career and his involvement in the World Cup. Leave your questions below, and don't forget to tell us where you're writing in from. 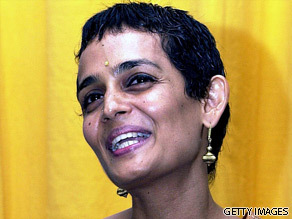 When "The God of Small Things" first hit bookshelves in 1997, Indian born author Arundhati Roy was instantly catapulted to global fame. Arundhati Roy is your Connector of the Day. Her debut novel shot up the "New York Times" bestsellers list and snapped up the coveted Booker Prize for Fiction. Roy was no stranger to success -– she’d already won a National Film Award for Best Screenplay - but even she was shocked at the amount of international attention. Roy has continued to hold the spotlight thanks to tireless political activism on issues as far-ranging as India’s nuclear weapons, Enron and the war on terror. Her efforts were finally recognized in 2004 when she was awarded the Sydney Peace Prize. Roy’s not afraid to speak her mind about the social causes close to her heart, even if it means getting criticized in the process or even being sent to jail. Currently, Roy has a new book of essays out called "Field Notes on Democracy".